Help us get organised! If we haven't correctly identified which area this picture is best listed under, please select it below and click Done! The Corrigal Farm Museum had an open day on 28th March 2004 where you could find out how to make things from straw. 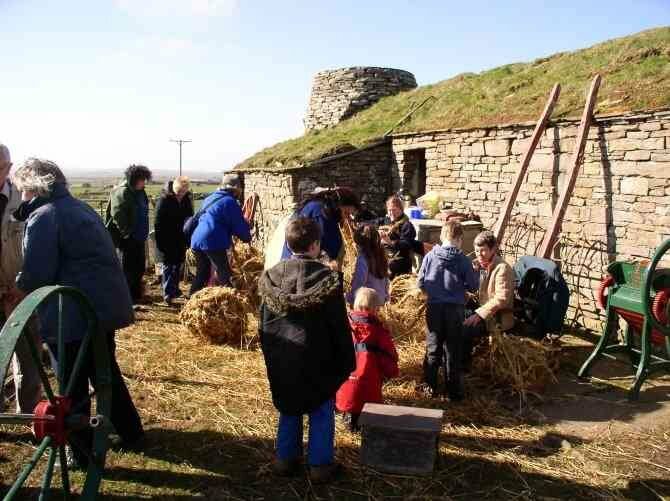 One of the main attractions was provided by a group of Conservation Volunteers who were making miles of straw rope for simmans to roof The Glen in Rackwick, with lengths balled up into kloos. Now is that all that is on the roof, or is it laid onto stone? Does anyone have a photo of The Glen? What a wonderul picture. Thank you.